Continuing to revel in the ‘good time’ cheer of last year’s 50th anniversary celebrations, the ‘career spanning’ behemoth, Made In California, attempts to draw together the most diverse, if not complete, history of Californ-i-a’s most ‘treasured sons’. Of course we’ve already been lavished with the ‘ultimate’ original Pet Sounds and SMiLE sessions, whilst the noughtie’s resurrection – after years spent in a semi-comatose wilderness – of The Beach Boys’ patriarch, Brian Wilson, has also produced a re-recorded, concluded, version of that latter opus – four decades after it was first conceived. A renaissance in fact, has even brought both the founding – for obvious reasons and beyond anyone’s control, missing the group’s spiritual heart and soul, Dennis and Carl Wilson – and synonymous additional members together for a reunion tour and album (That’s Why God Made The Radio). Acrimony and dispute have been conveniently cast aside for the purpose of honouring their own contribution to the annals of rock and roll/pop history. Even during The Beach Boys’ most arid creative spells, countless ‘best of’ compilations – featuring various collated themed track lists, rarities or former glories – have not only filled the coffers, but less cynically reaffirmed our faith in the group’s enduring legacy. That somewhat familiar story is once again pieced together; retold with a potted chronologically ordered suite of originals and alternative mixed versions from the back catalogue, spread over four and a half CDs. Previously unreleased live performances and a, ‘from the vaults’, heralded selection of a cappella, instrumentals, demos and variants on the classics, cover the remaining one and a half CDs. Presented in a faux-high school yearbook (a copy of Brian’s ‘schooldaze’ essay, My Philosophy, from 1959, is included with the extensive notes), faux memorabilia fashion, Made In California boasts a ‘174-track’ spread, with every one of The Beach Boys studio albums, including many of those numerous compilations, represented. A historical peregrination of America awaits; from the pilgrim landings at Plymouth Rock to the fateful Vietnam student demonstrations at Kent State University; played out to a soundtrack that begins and ends with the innocent, if naïve, joyous youthful exuberance of their hometown state. There’s no more fitting an opening than the earliest recordings. Taped at home, this first insight into The Beach Boys, in their natural environment, is partly a knockabout sequence of ‘mic’ testing, jostling – elder sibling Brian tirelessly attempts to keep everyone in line – and finger-clicking a cappella practice. Ever the sun-kissed apostle of ‘fun, fun, fun’ and anarchy, Dennis Wilson, chips in with his address – the forever hallowed, now just a heartless bank of scrubland, Hawthorne residence – and a fit of the giggles, as they attempt to finish a version of their first hit, ‘Surfin’. Catching a zeitgeist wave of feckless youth culture, the group’s Surfin’ Safari, USA and Girl days are served up alongside the coy hot rod and gay abandon ‘bobby sox’ snuggling, Little Deuce Coupe, ‘Be True To Your School’ and Dance, Dance, Dance anthems, on this first installment of the sextet CD collection. In amongst the litany of felicitous highlights are studio session versions of ‘Surfers Rule’ and ‘I Get Around’. As an invited ‘fly-on-the-wall’ we’re party to the group’s intimate chatter, those, all so, accustomed hits delivered in their rawest form. An early flash of that reflected tone, so prominent on later LPs during their 70s epoch, is found on the 1963, whimsical ode to the virtues of returning back to the safety and humble surroundings of ‘ma and pas’, ‘Back Home’. Betraying the tell tale signs of homage to one of Brian’s most important inspirations, Phil Spector, the oozing sax and languorous ‘girl power pop’ production is a thinly veiled nod to one of Spector’s most famous muses, The Ronettes. There would be a lot more of this to come. A couple of later versions of this originally down-at-heel slumbering R&B paean, were accorded a more country ‘fried’ feel, with a final version making it on to the group’s 1976 album, 15 Big Ones. Twisting and cavorting onto the second CD in this reappraisal of sorts, a trio of congruous, out of the ballpark smashers, usher in the next chapter. ‘Do You Wanna Dance (2012 Stereo Mix)’, Help Me, Rhonda (Mono Single Version)’ and ‘California Girls (2002 Stereo Mix)’ were borne of beach fronted campfires, innocent love-ins and a fraternity lifestyle. The latter of these had partially announced a step change however. More confident with its swaying tanned hip rhythm, pendulous bass line (thanks to the Fender Precision of Carol Kaye on that one) and gently prodding organ, California Girls eased in a new vitality and marked the beginning of a musical cold war with the group’s most revered rivals, across the Atlantic, on the Mersey, The Beatles. Still quite heady in 1965, unreleased nuggets of interest, such as the Coney Island, patter cake, Wurlitzer cyclonic ‘Amusement Parks USA (Early Version)’, and the haunted Four Freshman throwaway, ‘Graduation Day (Session Excerpt And Master Take, 2012 Mix)’, hark back to more innocuous times of coy courtship. But as ennui set in and the patriarchal Brian now mastered the limits of the studio, The Beach Boys voiced a growing anxiety – or the growing pains – of youth. The tide’s internal beckoning now seemed to reflect something less carefree. Turning to the burgeoning talent of lyricist and ad jingle writer, Tony Asher, for an inspired ‘take’ on the plaintive concerns of this troubled youth, Brian set out to produce his and the group’s first masterpiece, Pet Sounds. Often described as, and, spawning the famous ‘teenage symphonies to God’ by-line, this ethereal suite was perhaps rock and pop music’s first triumph; balancing contemporary earthly concerns with a divine musical accompaniment from beyond the heavens. Even the Wilson brother’s inimitable cousin, Mike Love – a stickler for routine, and keeping with the winning formula of yore – weighed in with the rapturous edict, ‘Wouldn’t It Be Nice’, as the album’s opening statement. Time is of the essence and this 28-track chapter hasn’t cause to stay too long, making its way through The Beach Boys Today!, Summer Days (And Summer Nights!! ), the Beach Boys Party, and then onto the failed, but salvaged, infamous SMiLE remnants: collected together for a far from convincing, Smiley Smile, patchwork. Sent into his first, of many, manic depressive spins, the initial disinterest and panning of Pet Sounds, did little to fill Brian with confidence or, as his life’s eternal quest bares witness, love. Only when brought to London, where the hipsters, music giants – including a ‘in awed’ Paul McCartney – and kids converted and lapped it up, did it finally take off and begin to sell in droves. All too late for Brian who dreamed of even bigger ambitious projects; including what would be the failed SMiLE; an album whose very title should enact a radiant grin. Sketching a loose travelogue of America, with both musical and historical allusions and references to Gershwin, the fairground showmanship of P.T. Barnum, Steinbeck, the Native Indians plight, ‘liberty bell’ and Hawaii, this project would dare to even ‘out do’, an at their zenith artistically, Beatles – something that the precursor, ‘greatest pop single of all time’, ‘Good Vibrations’, was but a glimpse and psychedelic illuminated taster. We should all know the story of woe by now, Brian’s fall into despair and eventual exhaustive collapse, which led to a forty-year gap between the initial recordings and eventual completion in 2004. A transformation should have seen The Beach Boys newly conceived Brother Records imprint take off on a stellar christened voyage, with the most sophisticated, meta-textual album yet. Instead they limped along with the stripped bare, inferior Smiley Smile – as a consequence, every album since was heralded as the greatest comeback since Pet Sounds for Brian. So many of that LP’s tracks – ‘Heroes And Villains’ (also a single), ‘Our Prayer’, ‘Vega-Tables’ and ‘Cabin Essence’ – are take from the original SMiLE sessions deluxe edition, released just a couple of years ago. Whilst the beguiling diaphanous hymn like, ‘Wonderful’, is a 2012 stereo mixed version. Depending on how you see it, Wild Honey is either a return to nostalgia – pop and rock and roll’s R&B roots – or a brief respite; a resting post for Brian to collect his thoughts before producing that next imbued winning epic. A plastic soul revue perhaps, yet Wild Honey’s kickback can’t be denied its charm; that title anthem is electric, Carl announcing the group’s return with virtuous joy. Mellifluous, unbridled pop; demeaned by many critics, and once again appreciated more overseas in the UK than at home, Wild Honey has since been reappraised as one of their highlights. It begins with The Beach Boys spiritual compass, Carl, delivering one of their most rejoiced love treatments, ‘Darlin’ (2012 Stereo Mix)’, and ends on the washed-out but not yet washed-up magnum opus, Surf’s Up. CD number three shines a light on the shifting sands that prompted their departure from the label that had built its entire reputation and wealth around the group’s early 60s success, Capitol Records. An earlier break had failed with the abandoned SMiLE leading to a further two albums for Capitol, Friends and 20/20 – both represented here. Previously missing from this period or gone awry, is an alternative version of the Friends’ original, ‘Meant For You’: a refreshed from the Maharishi retreat Mike Love, returns in 1968 to add saccharine to a less overproduced recording. There’s also stereo mixes from 2012 of ‘We’re Together Again’ and ‘Do It Again’ – the opening tape delayed drum pounding, return to the source of the surfing vibe, stomper from 20/20. Recorded during the last Capitol sessions, the cavernous reverb experimental, dippy, aviation metaphor ‘Sail Plane Song’, is a hazy vapored ditty of the 5th Dimension and Harpers Bizarre variety – only ever made available on the Endless Harmony Soundtrack, 1998. Eventually signing a pact with the steamboat chuffing logo adorned Reprise – at the time part of Warner Bros -, the boys would release all their records under the consanguinity Brother Records imprint. That new sense of spirited freedom, or alluded resistance, is reflected by the label’s symbolic Native Indian artwork: the plight of North America’s indigenous tribes, etched out on the lone rider’s outstretched hands and tilted back, pitted, head; as though asking for guidance or perhaps remonstrating with the spirits that abandoned them. As it turned out, the melancholic surf noir blues direction produced, arguably, their most interesting and lamentable material. Sunflower, with its leitmotif of forsaken and unrequited love, featured an envious songbook (‘Slip On Through’, ‘This Whole World’, Forever’); whose star turns, Carl and a surprise to many, Dennis, now regularly took on the burden that often stifled their brother Brian. By now Bruce Johnston was a prominent fixture – as a contributing songwriter, lead vocalist and co-producer – and both Al Jardine and Mike Love’s artistic share increased, with mixed results. Although creatively at their peak, Sunflower wilted badly (barely reaching a pitiful #151 in the US billboard) and the despondent nature, plus social commentary of Surf’s Up also failed dismally: but that’s another story. In a state of flux, the featured Al Jardine written – co-produced with Brian – doo wop, harmonica romping ‘Susie Cincinnati’, is a 2012 mix that does little to improve on the boogaloo ‘honky tonk’ style original from both the single (B-Side to ‘Add Some Music To Your Day’) and LP versions (appeared on 15 Big Ones). As a record of completion it will however suffice. Seeping onto the fourth of this sextet cannon, a triumvirate of Surf’s Up picks, draw 1971 to a close. “Ecological aftermath” remonstrating, ‘Don’t Go near The Water’, Eisenhower era dappled optimism, ‘Disney Girls’, and the poetically aquatic symbolic quest, ‘Feel Flows’, failed at the time to lift this particular driftwood out of the sea of inertia. Though we shouldn’t be surprised now by Dennis Wilson’s transcendent, primal but emotional roller coaster vocals and songwriting laments, his heartbreaking ‘(Wouldn’t It Be Nice To) Live Again’ triumph was left off the album for Al Jardine and Gray Winfrey’s goofball manicured, ‘Take A Load Of Your Feet’. A note of envy, even from his own kin, was detected as Dennis’ other, equally, wondrous, ‘4th Of July’ was also dropped from the running order. Truth be told, Dennis withdrew both those contributions when the former of the pair wasn’t, as he stipulated, given the coveted finale spot, a spot taken by Brian’s album title track. As a consequence of in-fighting, and with Dennis also suffering from a busted up hand, Carl had brought in South African’s Blondie Chaplin, on guitar and vocals, and Ricky Fataar, on drums, to bring some calm and focus to the group – hey it worked for The Beatles: right?! The resulting new venture that sprung to life from this new union with the former Flames journeymen hardly set the world alight. So Tough, attributed to Carl And The Passions, was another mixed affair, split between Chaplin’s additional R&B roots, and a more rock orientated boogie feel. An auto piloting Brian and upset Johnston didn’t exactly help matters – Johnston quitting, or pushed, before sessions began. It’s rather telling that this compilation only features a meager offering from it. Moving on at a pace now, the group’s lack of success and acclaim prompted another spark of ingenuity: or perhaps not. At the whim of their manager Jack Reiley, The Beach Boys moved on masse to the enchanting town of Baambrugge (14km adrift of Amsterdam) in the Netherlands to record their next album, Holland. Crippled by depression, the group’s talisman, Brian, seemed incapable of even boarding the plane ride. Eventually coaxed to the flatlands and idyllic canals of the Dutch capital, Brian and his brethren far from inspired by those surroundings, produced a homesick love letter to…well, home instead: that isolation just caused more sadness, as the group pinned for Hawthorne. Yet they somehow created a career high, both critically and commercially, filled with dewy-eyed requiems to the literature and landscape of the USA. Celebratory boogie waltzing tracks ‘Sail On Sailor’ and ‘The Trader’ sat alongside the ‘California Saga’ suite – a traversing narrative of reverent eagle nested heights and atavistic beguile – on this ambitious narrated whimsical tour and purview of a continent – perhaps a brave attempt to once again resurrect the fabled SMiLE template. Whatever the circumstances and happenstance, Holland blossomed. It would take almost three years until the boys follow up, 15 Big Ones. Looking backwards to stumble forward, there’s a certain retreading of old steps going on at the heart of this record. That patchy album is served on this compilation by the ‘extra verse’ lumbering version of that ol’ Chuck Berry staple, ‘Rock And Roll Music’ – only twelve years after The Beatles smashed it and made their own! –; the alternative mix of the Tropicana beach combing breezy, ‘It’s Ok’; and the sweetly odd lovesick bop, ‘Had To Phone Ya’ – as it turns out the opening trio of songs from that very LP. Syrupy and far too mellifluous, with a clutch of forgettable originals and innocence gushing covers – from ‘Chapel Of Love’ to ‘Blueberry Hill’ – 15 Big Ones was perhaps a pretty glib title; though it somehow scored the boys their best chart position since the Beach Boys’ Party! album in 1965: go figure!! A succession of muted – and often left floundering in relative obscurity – albums followed. One of those late 70s misfires, Adult Child, was denied even an official release; picked over with its bounty of highlights rehashed for later records. Here it is allowed a brief lounge in the sun: an alternative version of ‘It’s Over Now’ making the cut. Created during a period of rehabilitation for Brian, the almost single-handedly produced, written and performed, The Beach Boys Love You, did get an inaugural release. Brian once again in the mood for experimenting grew enamoured with the Moog Taurus; using it to fashion out a peculiar mix of electric funk and honeycomb dusted soul. Representing that sumptuous affair is the ‘tripping the light fantastic’ on a moonbeam ride around the cosmos, almost childlike, ‘Solar System’ paean and the bended Wings-esque guitar beatific, ‘The Night Was So Young’. Earmarked for the L.A. (Light Album) in 1978, the twinkly elegiac, ‘California Feelin’ and a fluttering of meditative waltzes and love songs from the quasi-mystical inspired, M.I.U, bring us up to the end of the 70s. Despite the abundance of talent in The Beach Boys, only Dennis managed to cut loose with a defining, if not one of the 70s best, solo albums, Pacific Ocean Blue. Though he tried, Mike Love’s first effort, First Love, failed to make the cut. His sentimental open therapy session for Brian love-in, ‘Brian’s Back’, shows us just why. How lucky for us then that we’re treated to a special ‘alternative version’. Thanks! By now we’re really motoring forward, passing the golden epoch and running out of creditable material to salvage. Dennis had as we know, finally produced that heartbreaking, laid bare soul album he always threatened, then promptly spiraled out of control, whilst Brian continued to falter; leaving Jardine, Love, Johnston and Carl to keep the juggernaut on the road during the 80s. Included from that declining stretch, are the ‘single edit (2012 Mix)’ of their soundtrack to the ‘lampooning’ near-future flick, Americathon, ‘It’s A Beautiful Day’ – a befitting swaying fun cruising tune, documenting in a whimsical fashion the story of a oil barren US of A – and a Johnston produced, Love penned, beached whale of pop parody, ‘Goin’ To The Beach’. Critical but not yet out. The boys enjoyed more success with – here it comes again – their never-ending ‘comeback’ tours: namely the ‘Lazarus’ style liturgy performance at Knebworth in 1980. But then these live shows, relied upon a package of greatest hits and rousing album tracks from their golden years, rather than the contemporary ‘lite’, if not increasingly, toothless pop of Keepin’ The Summer Alive. An ill-fated enterprise that resulted in Dennis walking and tantrums from Brian – who originally envisaged producing an album of teenage melodrama covers from the Spector stable. Languishing between commitment and despair, Brian took minimal part, but relinquished much of the production to Johnston. Recorded during the initial sessions, The Ronettes made famous, lulling doo-wop, ‘Why Don’t They Let Us Fall In Love’, betrays the 80’s penchant for drum machines, but remains a steady if competent take on the day dreamer number. Taking a cue from his brother, Carl and Johnston give another Spector classic a run out, The Crystals’ ‘Da Doo Ron Ron’, a much less convincing if little underwhelming tribute. You may very well ask, where are all the enthralling examples of transcendence and harmonic uplift? Especially when faced with the inevitable MTV era, ‘god only knows’, cover of fellow west coast luminaries, The Mama And Papa’s ‘California Dreamin’. Bereft of their grinning maverick Dennis –drowned in an ill-fated impromptu bout of midnight diving in 1983 – the boys succumbed to more hazy attempts of recaptured youth; writing more summery ‘surf’ hits. Which is kind of ironic, as they still scored major hits; such as the tropical rum-soaked ‘Kokomo’ from the Cocktail movie. Into the 90s, a deeply troubled Brian yearned reflectively, pursuing a laid bare quest for forgiveness and belief. Recorded in 1995, later to be the opening on Brian’s 2004 solo album, Gettin’ In Over My Head, the Carl ministered ‘Soul Searchin’, is a poignant if not sad outpouring of past misdeeds on the road to pseudo deliverance – falling just on the right side of sentimentality. Also produced by Andy Paley and Don Was, the accompanying moiety to that song is another ‘previously unreleased’ spade dig from the past, ‘You’re Still A Mystery’. The almost full empyreal choir is on set to add grace and harmonious poise to Brian’s vocal, on a tender tumble down the tube to Pet Sounds, lament. That’s Why God Made The Radio LP a fluffy but well-intentioned success. The art of which, as they’ve always accomplished, is putting into angelic, diaphanous song even the most basic of human emotions, actions and fears: celebrating a basic need to feel alive. As the chronological ends, the box set now changes with the penultimate CD, splitting into a collection of concert material. Again this fifteen-song selection is a potted commentary through the annals, beginning with a hissing head-nodding cymbal jamboree version of Del Shannon’s ‘Runaway’ (recorded from an appearance in Chicago, 1965). From a hallowed gospel organ, serene rehearsal in Hawaii of the Box Tops ‘The Letter’, to a Blondie Chaplin fronted, jammed out boisterous ‘Wild Honey’ (New Jersey 1972), we’re made keenly aware of the boys tight but explosive reputation on stage. Those complex interwoven, harmonies only ever occasionally failed to reach the dizzying heights of the recordings themselves; if anything a raw, sometimes gruffer, vocal sounded more fragile and real; capturing something more intimate and true. That dynamic Wilson duo of Carl and Dennis once again shine brightest: Carl leading the rocking ‘It’s About Time’ (Chicago 1973) and cheery faux-girl group anthem, ‘I Can Hear Music’ (Maryland 1975), whilst the forever forlorn Dennis joins his sibling on the heart pranged ‘Only With You’ (New York 1972) and suitably sorrowful balled, ‘Little Bird’ (Chicago 1968). Unfortunately not even a last hurrah of herculean effort – of which there was none – could save the dreary ‘Summer In Paradise’ from over-sentimentality. A cringing protestation on consumption and the environment that suffers terribly from an over-ripe production and silky baseball jacketed cabaret feel. Worse, it sounds like a pastiche of there own work; a track that even the former Beach Boys bit-part keyboardist players, come songwriters of kitsch pop, the Captain & Tennille, might turn their nose up at. Six and a half hours later and we’ve reached the final stage in this exhaustive, Made In California, collection. Once again, from the darkened recesses of the vaults, appears another anticipated box of festering and forgotten recordings; deemed either superfluous or just squeezed out of previous Beach Boy volumes. A Capella, spine tingling shivery mixes of Slip On Through and This Whole World left this humbled cynic in a teary-eyed state, and Brian’s bravest Frankie Valli-registering ‘alternative out-take’ vocal on ‘Don’t Worry Baby’ reminds us that the group’s genius was also an angelic voiced singer once. Instrumentals – surely for the completest – of ‘Mono Kama’ (recorded during sessions for 20/20), ‘Why’ (a missing link from the M.I.U. recordings in 1977) and ‘Transcendental Meditation’ (original can be found on Friends), sit aside a lush stripped, ponderous demo of Dennis’ ‘Be With Me’ (20/20) and his rural boogie – quasi-The Band – ‘Barnyard Blues’. Only ever available as a bootleg, the loose, ‘hanging out’ and languorous ‘Lei’d In Hawaii’ performance is a rare oddity. Two held-back takes, ‘California Girls’ and ‘Help You Rhonda’, show a gentle, ad-libbing camaraderie between the group members, as they return – yet again – back to the downplayed ease and comfort of the campfire party days. Resurrected from a surprising source, a trio of assumed lost live tracks, performed for the BBC radio staple, Top Gear, in 1964 – ahead of the boys first European tour – were later found by a decent chap called Ian Gane, who’d taped a re-broadcast of the show two years later. Crackly charged, antiquated harmonies melt through the forty-odd year old recording, the boys cooing a ‘warm-the-cockles’ version of ‘Wendy’, followed by ‘When I Grow Up (To Be A Man)’ and a cover of The Mystics’ 1959 doo wop lullaby, ‘Hushabye’. In tributary reverence, the CD and album ends with a poignant memorial in the shape of a spooky ‘Carl Wilson: Coda’ – edited together in 2013, though a shorter version appears on the Capitol Records compilation, Hawthorne, in 2001. Finally succumbing to lung cancer in 1998, Carl was perhaps missed the most from The Beach Boys set up. A steady imbued influence throughout the group’s career; the youngest brother of the Wilson clan was its proverbial anchor and most composed soul. When Brian became trapped inside his own head, it was both Carl and Dennis who carried on, lifting the group above its stereotypical surf music label, to produce some of the most poignant recorded and composed songs of the 20th century. So far Carl has missed out on the championing appraisals – though Mike Love and Brian admitted he was more or less the group’s true leader, on commentary tracks from last years, That’s Why God Made The Radio -, unlike his siblings. Brian’s creativity and genius is ongoing and constantly reappraised, whilst Dennis and his stark, heart wrenched classic, Pacific Ocean Blue, has in recent years commanded a spate of documentaries and renewed respect: quite right! It can’t be long now before we see the same treatment for Carl. 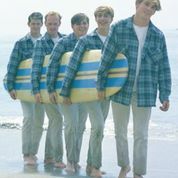 That crowning elegiac finale also pretty much sums up what The Beach Boys music achieved; Carl recalling a conversation he had with Brian about their success, his elder brother opining that the music celebrated ‘the joy of life in a real simple way,’ as the sound of a lapping tide upon the shoreline acts as a meditative backdrop: a misty-eyed return back to where it all began. Nestling as it does, next to a litany of similar ‘complete sessions’ and ‘deluxe’ editions and box sets, Made In California raises the question of worth. So much of this material does already exist for sure; though almost half of it is rare, if not appearing for the very first time. Umpteen million compilations, covering a myriad of themes –under the ‘Love Songs’, ‘Greatest Hits’, ‘Singles’ or various affixed ‘Surfin’ titles – have it’s true dug up or reshuffled their entire back catalogue, but there hasn’t been one definitive tome piecing it all together yet. As a complete purview of the group’s history and chronicle of fifty years, covering every turn and representing each individual member fairly, this collection could be considered the best attempt yet to build that concise story. Jesus, can’t you run a spell check on this? You’ve made countless errors and clearly don’t know what half of these words mean! I have been through this review quite a few times, I don’t understand your reference to ‘errors’…. Dennis was the middle brother.